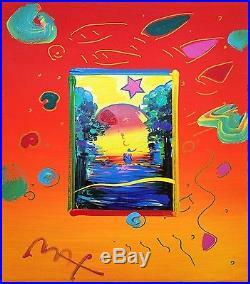 PETER MAX "BETTER WORLD" (OVERPAINT). FRAME SIZE: APPROX 19.5 X 17.5 INCHES. ARTWORK SIZE: 14 X 12 INCHES. SIGNATURE: HAND SIGNED BY THE ARTIST. 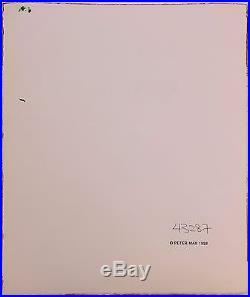 ARTWORK IS IN EXCELLENT CONDITION. ADDITIONAL IMAGES AVAILABLE UPON REQUEST. 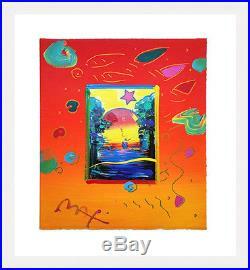 The item "PETER MAX BETTER WORLD (OVERPAINT) UNIQUE MIXED MEDIA 19X17 GALLART" is in sale since Friday, June 03, 2016.